In the last few sections, we have seen how we can reference a macro variable in values. Macro variable can also be referenced in variable names. 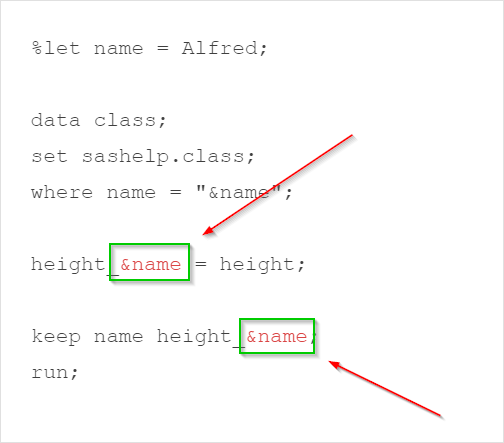 In this example, we have created a new variable called height_&name. When executing the program, SAS will resolve the macro variable from HEIGHT_&NAME to HEIGHT_ALFRED. 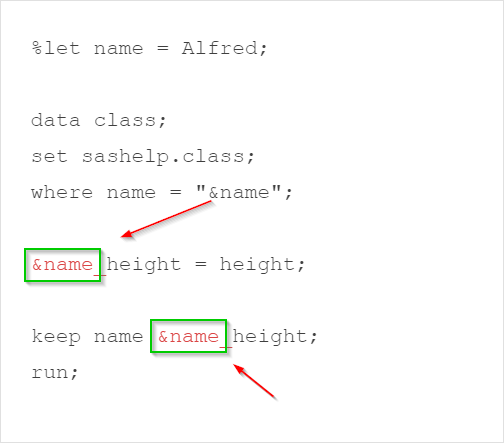 The macro variable &NAME is specified at the end of the variable name. 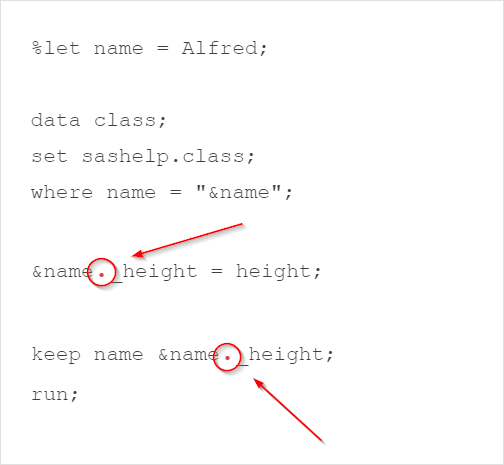 Now, what if we want the &NAME to be at the beginning of the variable name? ​WARNING: Apparent symbolic reference NAME_HEIGHT not resolved. SAS does not recognize that it is a combination of macro variable reference (&NAME) and some additional text (_HEIGHT). It treats the whole text (NAME_HEIGHT) as the macro variable reference! For example, SAS will look up the symbol table and check if there is a macro variable called NAME_HEIGHT. Since it cannot find it, it gives a warning message about macro variable reference not being resolved. ​Because of that, the new variable cannot be created. In order to separate the macro variable reference (&NAME) with the text (_HEIGHT), we need to add a period between the two. SAS will resolve the macro variable reference from &NAME._HEIGHT to ALFRED_HEIGHT. Create a new data set called CLASS_JANE from the SASHelp.Class data set. The data set should have only 1 observation from Jane. ​The text JANE in your program should be dynamically assigned using a macro variable.